Susie Furphy is a Hobart-based musician. As a baroque violinist, she performed with Van Diemen’s band in the 2017 Evandale festival, and has played with the Melbourne Baroque Orchestra for performances of Handel’s Messiah and Bach’s St. John Passion. Whilst living for 5 years in Cambridge, UK, she studied violin with Christopher Hirons (Academy of Ancient Music) and had the pleasure of working and performing with artists such as Judy Tarling (The Parley of Instruments), Margaret Faultless and the late Sir Christopher Hogwood. 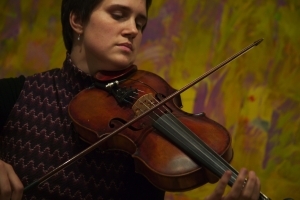 She was concertmaster of Cambridge based groups K239 ensemble, the Cambridge Sinfonietta, and The Cambridge Graduate Orchestra, for which she also was a soloist in Mozart’s Sinfonia Concertante. She also toured internationally with Melbourne-based early music specialist choir Ensemble Gombert, and the Choir of Ormond College. She regularly leads the Hobart Chamber Orchestra, and balances her Hobart musical life with her physiotherapy career and a young family.